A lantern clock which came to light recently set me enquiring into a little-known clockmaker named John Crucifex or Crucefix, for his name seems to have been spelled in a variety of ways. There was something a bit odd about John Crucefix, who seems to have made clocks, according to various estimates, as early as the 1680s, yet not to have joined the Clockmakers Company till 1712. Not many London clockmakers could get away with that, as the Company pressured all those who sought to practice the craft till they joined and paid their subscriptions. Robert Crucefix, who I felt must surely have been related, was also little known, though one record said he worked in Sweetings Alley, which I think must be Swithens Alley in the Spitalfields district of London. When I later discovered Robert's will, this was confirmed, as he was then described as of the parish of Christ Church Spitalfields. The name Crucefix, however you spelled it, did not strike me as very English. I guessed it was a French name. I knew nothing about Spitalfields, but when I looked it up I was amazed to find that Spitalfields was a whole world of its own where immigrants settled in vast numbers, most particularly French ones. So gradually it all began to make sense. Spitalfields originated from 'hospital fields' of St. Austin. It was settled by immigrant refugees from mainland Europe. Protestant refugees from arrived in Britain in considerable quantities after the revocation of the Edict of Nantes in 1685 by Louis XIV. Some French nonconformists (Huguenots) fled to England via Holland, some direct to England, beginning as a trickle in the 1670s, then as a flood in the years after 1685. It is estimated that somewhere between 40,000 and 50,000 moved here. Many of these, from all levels of society, settled in Spitalfields. Principally they were silk weavers, but there were clockmakers amongst their number. Those who needed it were given financial assistance from the government to get themselves established. Smaller groups of Huguenots also settled in other towns in England, principally southern seaports. The use of the French language died out in most places before the end of the eighteenth century, though it was still used by Huguenots in Bristol as late as 1812. By 1800 however most Huguenot churches, generally called 'French' churches, had closed and the population had been integrated into Anglican parishes. Their church records were generally kept in French, and French first names were often used as well as French surnames, sometimes long after the family had become 'anglicised'. Confusingly French surnames were sometimes 'translated' into English, one example of which in 1716 was one Rudold Le Blanc, who was written down as Rudolph White. Even worse, any part of a double-barrelled French name, which they so loved on account of their hinting at an aristocratic ancestry, might be selected at random as an English name, so that one French minister in 1691 named Paul Falantin Lariviere signed himself apparently at random as Falantin or Riviere. One Huguenot watchmaker named Philippe Girardel Constantine or de Constantine, was known either as Girardel or Constantine, or, when his will was proved in 1731, as Girardel alias Constantine. Fortunately the French name Crucefix left few options at translation, apart from the spelling as -efix or -ifex. I guess a crucifix was pretty much the same thing in France as in England. 1. 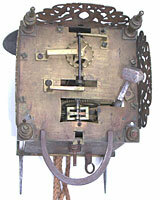 Full view of the John Crucefix lantern clock unrestored, with wings. Click for closer view. 2. 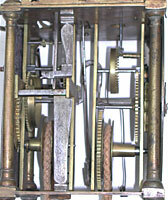 Top view of the movement to show the verge escapement, bell removed for photograph. Click for closer view. Oddly enough the spelling of the name even by the family themselves seems very inconsistent. In his will, Robert senior spells his name Crucefix. On his clocks John sometimes spells it as Crucefix too, but also several times spells it as Crucifex. It seems they were not especially fussy, and so probably would not be offended if they knew that I have spelled it Crucefix consistently just out of tidiness. There were many French churches in London, and I searched the records of several before I finally found that the Crucefix family attended the French Church in Parliament Alley, Artillery Ground, usually known as the Artillery. Here were recorded the baptisms of the children of Robert Crucefix and his wife Susanne (nee Barbot or Barbault), who were: 1696 Suzanne, 1700 Pierre, 1702 Elizabeth, 1705 David. Also baptised there were the children of John Crucefix (Jean) in the records: 1699 Jean, 1702 Pierre, 1705 Marie, 1708 Paul. I could not trace the marriage of either Robert or John, and they may perhaps have married before coming to England. Robert Crucefix joined the Clockmakers' Company as a Brother in 1689 - a Brother was someone who trained elsewhere than under a member of the Company. John did not join till 1712. Yet both were probably working there by the late 1680s. My guess is that Robert and John were brothers, though I have found nothing to prove that other than circumstantial evidence. They might perhaps have been cousins, but they must surely have been closely related and have come here at the same period for the same reasons - about, or shortly after, 1685? When I found Robert's will, dated 6th July 1734 and proved in April 1735, I was astonished at the amounts of money he left. He was described as being a clockmaker of the parish of Christ Church Spittlefield, for that was the official parish even though he may have belonged to the French church situated within that parish. The will reveals he had an older son named Robert, who had already had most of his inheritance, but was topped up to match that of his brothers at £300.00 each. The unmarried daughter, Elizabeth, received £400 and the married daughter, Susan, now wife of Lewis Roussel, only a nominal mention of £10, explained by the testator's specifying with a hint of bitterness 'she having cost me a good deal more than that'! Robert's eldest son, Robert Junior, also became a clockmaker but did not join the Clockmakers Company in 1745, a full ten years after his father's death. That is also a bit odd. Robert Crucefix junior, rather than Robert senior, seems to be the one who took an apprentice named Charles Coulson in 1733 when he was described as being of the parish of St. Giles in the Fields. We know Robert senior was still in Spitalfields in 1733 and died there in 1735. From his estimated birth year we know Robert junior must have been adult well before 1720, was working in 1733, but did not join the Clockmakers' Company till 1745. If he was apprenticed at all in the trade, there is no record of it. If he was apprenticed to his own father, then there was no need for an official apprenticeship bond. It is as if he was able to trade without joining the Company as long as his father was a member, and it took a further ten years after his father's death before he became one. Not many clocks seem to be known by Robert Crucefix, and all of them apparently by Robert senior. There is a record of a longcase clock and a bracket clock, but I have not personally come across anything by him. John Crucefix was made free in the Clockmakers Company in 1712, as a Brother, implying he too learned his trade elsewhere than in the Company. His two sons, christened as Jean and Pierre, were apprenticed through the Clockmakers' Company as plain John and Peter - the Company founded almost a century earlier specifically 'to keep out Frenchmen' were not having any fancy Frenchified names. John was apprenticed in 1714 to Philip Abbot, Peter in 1716 to John Lewis. Their father John was then said to be of the parish of St. Botolph without Bishopsgate, which was the next parish adjacent to Christ Church Spitalfields, where Robert senior lived. Of John Crucefix's work I know of ten or eleven clocks, most being thirty-hour lantern clocks, one a thirty-hour hanging wall clock, and one a Turkish Market bracket clock, one described in Britten as a 'sheepshead' clock, by which he meant a lantern clock with a wider chapter ring (like the one pictured here), and one month duration longcase. His lantern clocks would generally be expected to have wider chapter rings, by virtue of his having been influenced by the French style (which had wider rings) and by the fact that wider chapter rings were normal by about 1700, from which period some of his clocks must date. The wider style of chapter ring would project further than usual at each side outside the upright pillars, as here. The wide chapter ring also hangs down below the bottom of the frame into the space between the front 'feet', and also projects at the top into the front fret, which is cut back to receive it. 3. The movement seen from the left hand side. Note the fancily-filed hammer stop spring incorporating a comic jaw and mouth. Click for closer view. If we judge by the apparent date of his latest clock, John Crucefix must have been working till about 1730. Oddly enough some of his clocks clearly date well before the 1712 date of his joining the Company. We know he was working by 1699 and quite possibly earlier, judging by the style of his clocks. If he was the brother of Robert Crucefix senior, then it looks as if he too got away without joining for long enough, just as Robert junior did. It may be pertinent that he joined in 1712 in time enough to become an established member in order to get his own sons apprenticed through the Company in 1714 and 1716. We don't know whether John lived in St. Botolph's parish all along and simply used the Artillery Ground church, as his brother Robert did, or whether he later moved down to St. Botolph's parish after his children were born. Although we know that Robert Crucefix junior, his brother, Peter Crucefix (son of Robert senior), his brother, David Crucifex (son of Robert senior), and Peter Crucifex and John Crucifex, (sons of John senior) were all in the clock and watch trade, we know of no work by any of them! There may be some significance in the fact that Robert, the elder of the two supposed brothers, was apparently the more prosperous of the two. I get the impression he was more of a well-to-do merchant. The few clocks known by him are of a higher class than John's far more numerous more relatively working class lantern clocks. Robert went for the upper market, John for the lesser. It is as if Robert senior's membership of the Clockmakers' Company covered his own activities and those of his son, Robert junior, and brother John too. It is highly possible that Robert was initially the head of the family business, which included younger brother John and, by about 1710, his son Robert junior. It is odd the Company did not enforce their membership, as they generally did. It may be that the Spitalfields district was on the outer fringes of the Company's enforceable territory. It may also have been that the Company attitude of that time towards immigrants was more lenient because Parliamentary toleration expected it and set example of it. What became of John Crucefix is not known. It may be that he died before Robert, that is before 1735. It may just be that John's side of the family were less well-to-do, for I came across no wills by any of them. Robert's widow, Susan, left a will when she died in 1738, said to be of St. Giles in the Fields, which presumably means she was then living with her son, Robert junior. Their other two sons, Peter and David both became watchmakers and moved out to Wandsworth in Surrey where David died in 1768 and Peter in 1768, both of them leaving wills. The lantern clock illustrated here by John Crucefix is of the centre verge pendulum type, that is with a pendulum situated in the centre of the clock between the going and striking trains. These clocks pose a bit of a mystery. On the one hand they are the easiest of all to identify, as, even if they have in any way been altered later, the central space makes clear that they began as verge pendulum clocks. On the other hand nobody knows whether the pendulum itself had a normal pear-shaped bob, like other verge pendulum lantern clocks, or had anchor-like flukes which projected each side into 'wings', as this example does. Certainly the side doors of such clocks had a slot in them to allow the pendulum to pass through - needed if the pendulum swing was wider than the clock's width with the doors closed. Some clocks are known with these apparently original slotted doors and with a normal pear-shaped pendulum bob. Others have the anchor flukes which project into what we usually call 'wings' or 'bats' wings'. But whether any of these slotted doors originally had the winged attachments is a matter of dispute amongst experts, who cannot agree. Some believe they did. Others believe that all wings and fluked pendulums on such clocks are later modifications based on an example (with reproduction wings?) shown in a book over a hundred years ago. The reason for the central positioning of the pendulum seems to have been to allow more space for alarmwork at the back of the clock, where the pendulum was normally fitted but where the alarmwork had to be. The competition for space by alarmwork and pendulum was removed by positioning the pendulum well away in the centre. Not every winged lantern clock had alarmwork, but most did. Lantern clocks with central verge pendulums must all date later than 1660 (when the pendulum was first introduced) and tend to end about 1700, when the lantern clock was going out of fashion, in London that is. Guillaume Crucefix and his wife Francoise, nee Dyel, lived in Rue Notre Dame in Dieppe, France. Their son, Pierre, married Judith Girardel, also known as Constantin, and had three children, Elizabeth, Robert and John, with whom they emigrated to London in February 1686. Robert and John were the two clockmakers.